"How did I gain so much weight? Help!" First, why do you gain weight so easily? Now, the information on this page covers a very key point. It might seem too obvious at first, but the concept is quite helpful. If you really understand this you'll know why you gain weight. And if you know why you gain weight you can do something about it. 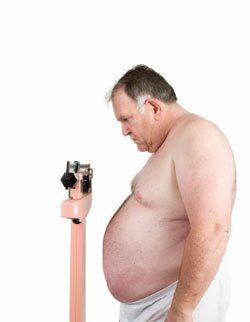 Lets say your ideal weight is 150 pounds (lb), which is about 68 kilograms (kg). There is a certain amount of food intake -- a certain amount of energy that you ingest -- and if you keep this amount fairly constant you'll stay at about the same weight. If you take in the right amount of energy you'll stay at 150 pounds. Let's just say it's 1700 calories per day, just for the sake of discussion. It's somewhere in that range. Or more than a few pounds. For our example, let's just say one day you look down and your belly is hanging down to your knees. And now you weigh 300 lb (about 136 kg). Uh oh!! You're suddenly -- or not so suddenly, because weight has a way of creeping up on you -- double your ideal weight. How did that happen? You might assume that if your weight doubled, then you must have been eating twice as much. But is that true? If your weight doubled, does that mean your food intake doubled? See, this is an interesting question and it's an important one: How much do you need to increase your food intake to make your weight increase? You were eating 1700 calories a day before and maintaining 150 pounds. So now, at 300 pounds, does that mean that mean you've been eating 3400 calories every day? The answer to this is "no". To double your weight you don't need to double what you eat. Far from it. Let's go over an example to show how it works. The easiest way to do it is by using a formula. Now, there are a number of different formulas that predict weight based on calorie intake. None of them is perfect, but they'll give you a pretty good idea. And for our purposes they work just fine. So we'll use one called the Harris-Benedict formula. What this formula and others like it do is make some estimates of the number of calories that your body will burn at rest. All these human bodies are burning calories all the time, awake or asleep, because there is metabolism occurring. We can call these calories burned at rest your "basal metabolism." It takes energy to breath, to pump blood, to digest food. All these things are part of your metabolism and they burn calories. It's not like being at the gym or running a race, but you aren't at the gym all day everyday. But you are burning calories all day every day, and most of your calories are burned by the basal metabolism. So, for an estimate of the number of calories that will maintain a body at a certain weight, the basal metabolism estimates work just fine. The Harris-Benedict formula predicts that if you ingest 1792 calories per day you will weight 150 lbs (68 kg.). And if you ingest 2445 calories per day you will weight 300 lbs. (136 kg.). As you can see this is a difference of 653 calories. That is a fair number of calories, that is true. But your calories at 300 pounds are not 2x your calories at 150 pounds. In fact it is just a 36% increase. That's about a third. So, using these rough estimates, if you eat 1/3 more your weight will double. This might look like bad news if you are gaining weight. After all, it doesn't seem quite fair, does it? You eat a bit more and gain a tremendous amount of weight. But, the good news is on the flip side. And that is this: you don't have to cut down all that much to lose a lot of weight. You don't have to starve yourself. You just have to get on a reasonable program. And you need to stick with it. Persistence equals results. Let's go through the numbers so you can see how it works. If you have number phobia, don't worry. It is not nearly as complicated as it looks at first. It is simple addition and subtraction that you can do on any $3.00 calculator. We'll go through an example using one of the formulas that scientists use to predict body weight based on calorie intake. We'll use the Harris-Benedict formula. Now, this formula -- just like any formula -- will not be 100% accurate. Any diet or activity level for you has to be tested in the real world to see how it works for you. But, going through the formula gives us an a general idea of the number of calories needed to maintain a certain weight, and that is what we need right now. The "BMR" in this formula means basal metabolic rate. Basically that means the number of calories you would need if you weren't active at all. This is how many calories you burn up every day if you are at rest. It is important to know how many calories you burn at rest, because, if all other things remain the same, if you take in less than this number of calories you lose weight and if you take in more than this number of calories you gain weight. Of course after you are done growing the only one of these that can change relatively quickly is your weight. It's your lean body mass that burns up the calories. If you weigh 150 pounds -- and you need 1700 calories and you take in 1700 calories -- you don't gain weight. But what if you take in more -- let's say 2000 calories? That's 300 extra calories per day. Then the extra calories get stored. As fat. There's 3500 calories in a pound of fat. So, when you take in an extra 3500 calories over what you need, you gain one more pound of fat. By the way, you'll find some references that will tell you that it's not exactly 3500 calories for each pound of fat. Are the right? Sure, because these things are all rough estimates. The only way to tell what will really happen for you is to test it in the real world. But, the estimates are still extremely valuable. They are estimates, after all. They don't need to be exactly right in order for you to get results. And that is all that matters. So when you say, "But I don't eat that much," it's probably true. See, you don't have to eat double to weigh double. And you only have to eat a little more than you need to be 20, 30 or more pounds overweight. It might not seem quite right or fair. But that's the way it is. So what should you do? Well, you can start with some simple steps that have been proven to help lose weight. Choose foods that have more nutrition and lower calorie density. Pay attention to what you drink. Even diet soda can make you fat. Be aware of the connection between alcohol and weight gain. And watch the hidden calories that can ruin your waistline. Do this and you'll be on your way to having a body you can be proud of. And by the way, if you don't have a copy of Dr. Dan's Super Weight Loss Plan you should get your copy today. It has everything you need to lose that extra weight and keep it off.